The Whitecaps played their first game on May 5, 1974, when they fell to a 2-1 home defeat to San Jose Earthquakes. Though the first match was a loss, the crowd saw defender Neil Ellett write his name in the history books that day by scoring the Whitecaps’ first-ever goal in the league. Their first playoff appearance in 1976 was against the Seattle Sounders. In 1979 Vancouver won it all and became the city’s first professional sports team to win a major North American Championship when they defeated the Tampa Bay Rowdies. Upon return to Vancouver on September 9, 1979, as many as 100,000 people lined Vancouver’s Robson Street to salute their heroes during a championship parade, arguably creating the most historic moment in Whitecaps history. The few years following their championship win of 1979, the Whitecaps were unable to defend their title. Hopes were high for a second NASL title in 1983, as Vancouver played host to the Soccer Bowl championship match at the newly-built BC Place Stadium. In fact, the Whitecaps 2-1 victory over Seattle on June 20, 1983, was the first sporting event to be played in BC Place and attracted a crowd of 60,342. The demise of the North American Soccer League (NASL) in 1984 resulted in the formation of a new league, the Canadian Soccer League (CSL), in 1986. 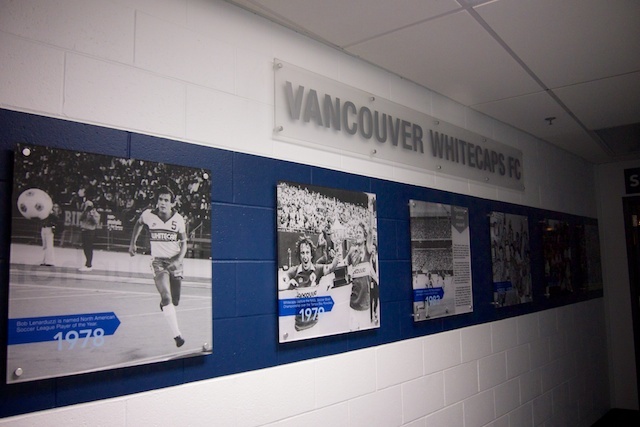 This change in leagues was accompanied by a change in team-name, as the Whitecaps became the 86ers, which name came from the year of Vancouver’s incorporation as a city (1886) and the year of the club’s founding (1986). The 86ers entered a new era when the CSL folded and they became members of the American Professional Soccer League (APSL). With a new look, logo, and colours (red, black, and white) in 1993, the 86ers finished top of the APSL regular season standings before their season was abruptly ended in the playoff semifinals, as Los Angeles Salsa won 3-2 in a shootout at Swangard. On October 26, 2000, after widespread public support, the 86ers formally changed their name back to the Whitecaps after their new owner, David Stadnyk, purchased the naming rights from former NASL Whitecaps director John Laxton. Local businessman and current owner Greg Kerfoot took ownership of the Whitecaps on November 13, 2002. On February 24, 2003, the Whitecaps men and Breakers women were brought under a new club structure called Whitecaps Football Club (FC). In 1999 the Vancouver Southsiders supporter club was also formed. It is Canada’s oldest and largest soccer supporter group. In 2004, the club announced plans to build the Whitecaps Training Centre on the campus of SFU. A memorable year ensured for Whitecaps fans in 2006, as both the men’s and women’s teams claimed an unprecedented double of USL titles. The club won it all again in 2008. Having submitted a proposal in 2008 to enter MLS, MLS commissioner Don Garber announced on March 18, 2009 that Vancouver would be the home of the 17th team in MLS. The team would start their inaugural season at a temporary stadium on the site of the former Empire Stadium in March 2011. It was also announced that later that year, the new team would make a renovated BC Place their new home. In March 2011, Vancouver Whitecaps FC kicked off their first season in Major League Soccer at Empire Field and moved to BC Place in October where they played four matches to finish their inaugural MLS season. On November 1, 2012, Whitecaps FC played their first-ever MLS postseason match. However, defending MLS Cup champions LA Galaxy defeated the ‘Caps 2-1 in the Western Conference First Round Knockout match in California. On September 6, 2012, Whitecaps FC joined the government of British Columbia and the University of British Columbia (UBC) in announcing the construction of the National Soccer Development Centre (NSDC) on the campus of UBC. The third season in MLS for Vancouver Whitecaps FC was one filled with great excitement and memorable moments. The ‘Caps were dealt a cruel blow, however, as captain Jay DeMerit ruptured his Achilles tendon just six minutes into the season opener and would not return until September. Though they missed their fearless leader for the majority of the season, Whitecaps FC still went on to set new club records in MLS for wins (13), points (48), and goals scored (53). Among the more noteworthy moments was a first ever victory over LA Galaxy on May 11, as well as a first win against rivals Seattle Sounders FC on July 6 at BC Place. Kekuta Manneh became the first Whitecaps FC player and youngest MLS player ever to score a hat-trick and he did it in Seattle. That match also sealed a fourth Cascadia Cup title for the ‘Caps – making them the winningest club in competition history – and the first trophy since joining MLS. Camilo Sanvezzo scored his first career hat-trick in a 3-0 win, giving the Brazilian the MLS Golden Boot as the league’s top scorer with 22 goals. 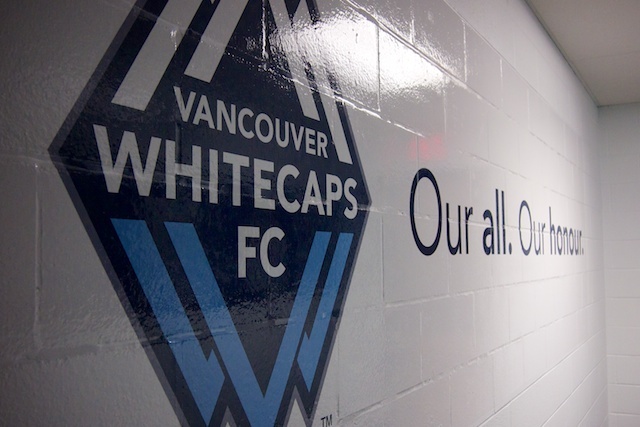 Read the full history on the Whitecaps’ website and follow the team on Twitter and Facebook for more information. John and I have been season ticket holders since 2012 and we are very excited for this new season to get underway. Each home match is a designated “date day” for us, and we have a fantastic time meeting other fans (we are members of the Southsiders supporter club) and cheering on our team at BC Place. Affordable single match tickets are on sale now along with 5-Packs, half season tickets, and season tickets. Join us in cheering on our blue and white at BC Place this season.